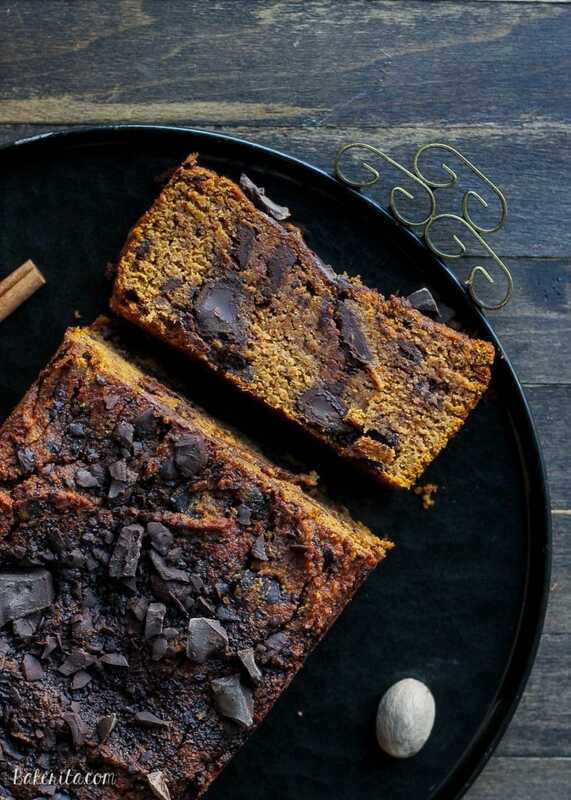 This Paleo Chocolate Chunk Pumpkin Bread is a good-for-you twist on your favorite fall treat. This easy, one bowl recipe is the best pumpkin bread I’ve ever made! It’s moist, full of chocolate chunks, and made with coconut flour and almond butter. Happy birthday to me! Today marks the beginning of my 22nd year on this Earth. The first few hours feel just like 21 felt, but I’ll keep you updated. To be honest, I’ve never been the biggest fan of my birthday. Being the center of attention is definitely not my favorite thing, and my birthday is usually a day I try to sweep under the rug as stealthily as possible. This year, I have no grand plans, just an amazing dinner at one of my favorite Thai restaurants in my new neighborhood with some of my favorite people. Really, I had to keep it low key because this weekend is going to be exhausting! And seriously fun and exciting. Because this weekend is the International Food Bloggers Conference! I have a jam-packed weekend that starts tomorrow at 8am and goes until late Sunday, with days full of learning, networking, and definitely a whole lot of eating. My weekend is going a little longer than most, because tomorrow morning I’m heading over to the Krusteaz headquarters bright and early to shoot some videos as a part of my ambassadorship with them. I will be incredibly nervous and hopefully not have to do a million takes. Fingers crossed all will go well so that I can share the videos here with you! I’m excited and nervous and I can’t wait to share a recap of the conference with you guys. It’s going to be awesome! 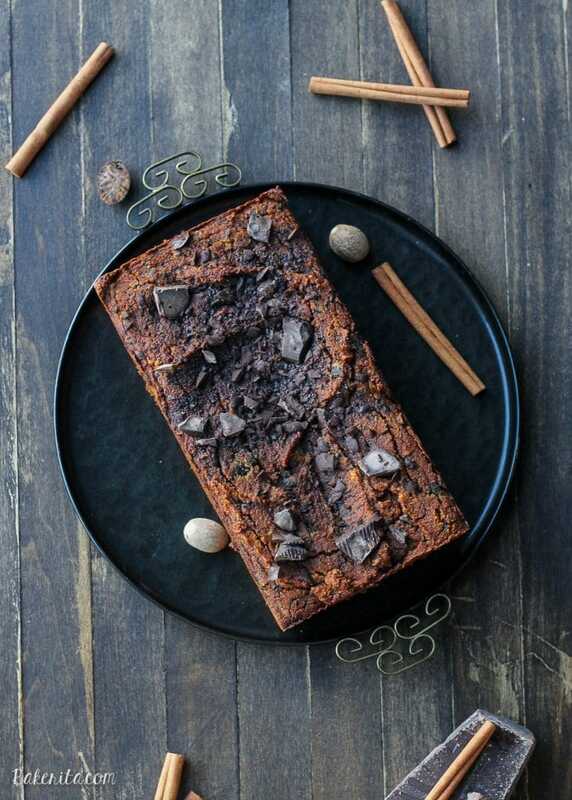 But enough about me, and more about the Paleo Chocolate Chunk Pumpkin Bread I’ve been teasing you with pictures of. This bread is the bomb. 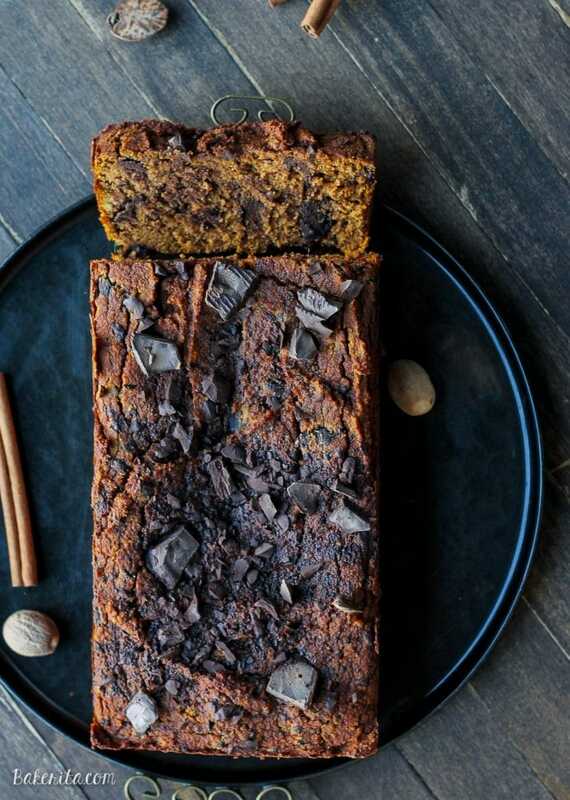 I took my favorite and all-time site favorite Paleo Chocolate Chunk Banana Bread, gave it a little spin and a couple twists, and voila – perfectly transformed into Paleo Chocolate Chunk Pumpkin Bread. Because pumpkin is not as sweet as bananas are, I used coconut sugar to sweeten it up a bit. Coconut sugar works perfectly here because it’s a dry sugar, unlike maple syrup or honey which would add too much liquid to this batter. I’m huge proponent of chocolate chunks, which you know if you’ve spent any amount of time hanging around the chocolate recipes on this site. 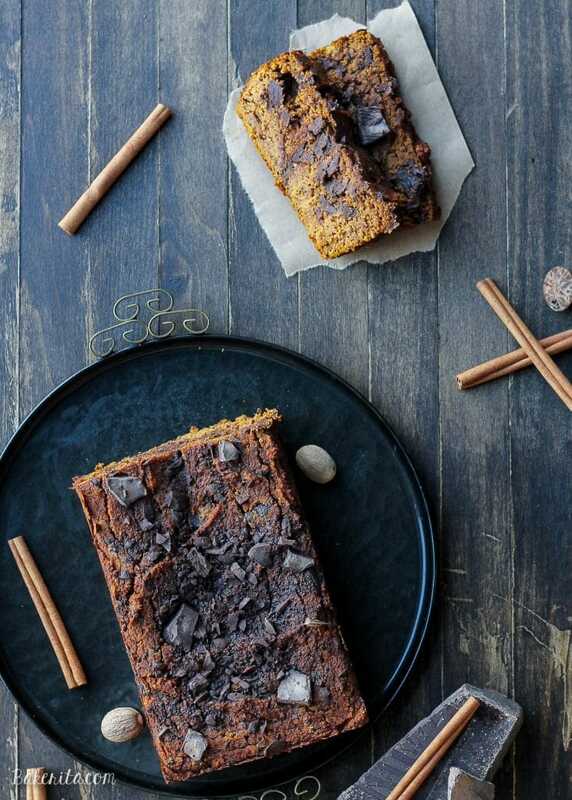 They add so much both visually and in terms of taste – nothing beats biting into a slice of still warm pumpkin bread and having those big dark chocolate chunks melt onto your tongue. If you want to keep this strict Paleo or refined sugar free, make your own Paleo chocolate. I promise – it’s super easy! This will be a fall favorite around here, I can guarantee, and I hope it’ll be a favorite in your house as well. Grab your pumpkin and get baking! Grease one 9"x5" loaf pan and preheat the oven to 350ºF. In a large bowl or mixer, combine the pumpkin, eggs, coconut oil, coconut sugar, vanilla extract and nut butter until fully combined. Add the coconut flour, cinnamon, baking soda, baking powder, and sea salt to the wet ingredients and mix well. Fold in the chocolate chunks. Pour the batter into the prepared pan and spread it evenly. Bake in the preheated oven for about 50-60 if using a loaf pan. A toothpick inserted into the center should come out clean. Remove from oven and allow to cool on a wire rack for about ½ hour. Flip out onto a cooling rack to finish cooling. To keep this bread completely Paleo and refined sugar free, make your own Paleo chocolate chunks! First of all, happy birthday! I hope you have the loveliest of days! 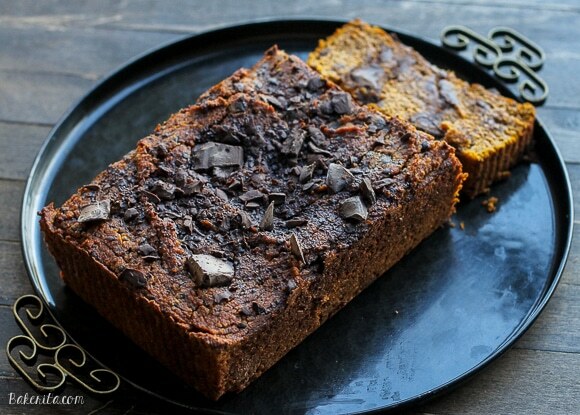 This pumpkin bread looks so good – I love the chocolate chunk addition! Enjoy your time at the conference too. Wow thats looks so good! Good luck with your recipe videos! I’m sure you’ll do great! Can’t wait to see them. 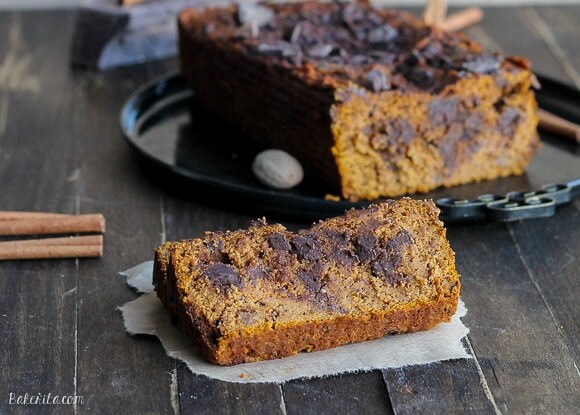 This pumpkin bread is unbelievable. Can’t believe it’s paleo! This looks totally fabulous- pinning! Happy Birthday!! I just made my first loaf of pumpkin bread of the season yesterday and can’t wait to try your paleo version. I am totally inspired by all of the paleo recipes you have posted recently! This is a beautiful chocolate cake Rachel! And most importantly, HAPPY BIRTHDAY!!! Today is my husband’s birthday! Rachel, happy birthday and this looks amazing! Can I include it on a roundup post of inspiring fall recipes with a link back to your site? Hi Chantelle – sure, feel free to include it on your roundup! Thanks. Happy birthday!!! Have so much fun celebrating and at the conference and shooting the videos! I’m sure you’ll do great! :) And this bread! Sounds fantastic! Happy Birthday, Rachel! How awesome that you’re shooting videos for Krusteaz, I’m sure you will do great! I’m totally loving this pumpkin bread by the way, I always use chocolate chips but never thought to use chunks! Such a great idea. Happy Birthday, Rachel! This bread looks amazing – I can’t wait to try it! Happy belated birthday Rachel! I tend not to like being the center of attention either – I’m SO awkward when people sing ‘happy birthday’ to me. Eeeek. This bread is so happening tomorrow – those chocolate chunks sold me. :) Hope you’re enjoying your weekend! Thank you Alyssa! Chocolate chunks are the best :) hope you like it. Wow!! This looks incredible. I’ve never baked with coconut flour before, but next time I stumble across some I’ll give this a try. Happy belated birthday, and I hope your video shoot went well!! LOOK AT THOSE CHUNKS! Holy cow this bread is something I dream of! I love that its paleo and made with coconut flour (by far my favorite flour)! I NEED to make this ASAP for my own good! Just wondering, can I use fresh uncooked pureed pumpkin? or do I have to cook the pumpkin first? Is the almond butter salted or unsalted? Could I substitute Pumpkin Pie Spice for the other spices? If so how much? Hi Deb. I use unsalted so I can control the amount of salt added to the recipe. You can definitely use pumpkin pie spice instead – it’s up to your tastes! I would use about 1-2 teaspoons depending on how much spice you like. Enjoy! Thank you Rachel. I made your zucchini version of this and it was divine. Even my non-paleo boyfriend is loving it. I topped it with a maple cashew creme “cheese”….yummy. For the pumpkin version should I drain the canned pumpkin first or is the additional liquid needed because of the coconut flour? Hi Deb! So glad you enjoyed the zucchini bread. I don’t drain the canned pumpkin – the zucchini only needs to be drained because zucchini has a LOT of excess liquid. I use the canned pumpkin as-is. Enjoy! One more question on this bread. If I leave out the chocolate chunks completely do I need to substitute additional sweetener or moisture? Very tasty bread! I couldn’t get the center to set, though, so perhaps I should have added more coconut flour to the batter. It seemed decently thick when I poured it into the loaf pan, but even after an extra ten minutes the center was wet when I cut into it. For my purposes it was okay. I sliced it, dried it out in the oven, then turned it into bread pudding from Paleo Parents website. Great gluten-free thanksgiving dessert. Thanks! I made this for my daughters who both love pumpkin. One of them gags at the thought of coconut, so I replaced the coconut oil with ghee, and the coconut sugar with maple sugar. They also do not want chocolate (who ARE these kids?! ), so I replaced that with pecans. I baked it in an 8×8 pan (like your delectable banana bread), and it turned out great! Next time, I may add some ginger and molasses for bit of kick! Oh, and chocolate chunks! So I can keep it for myself…thank you!